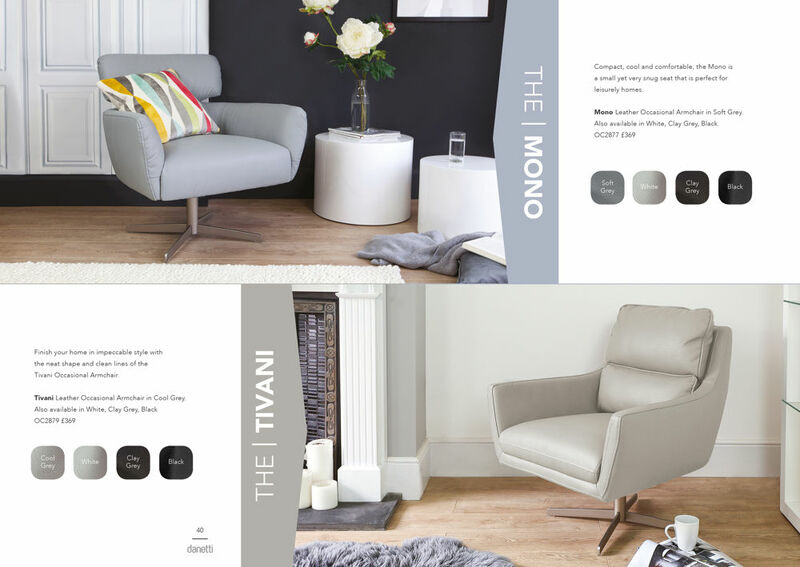 Our new 2016 lookbook is packed full our exclusive furniture pieces which we’ve styled using on trend colours and aspirational looks, all to give you designer inspiration for your home. Contemporary design and great products are things we think should be available to everybody; it’s the reason we do what we do. As a team, we are passionate about colours, trends and all things interiors with a strong focus on design, function and form. 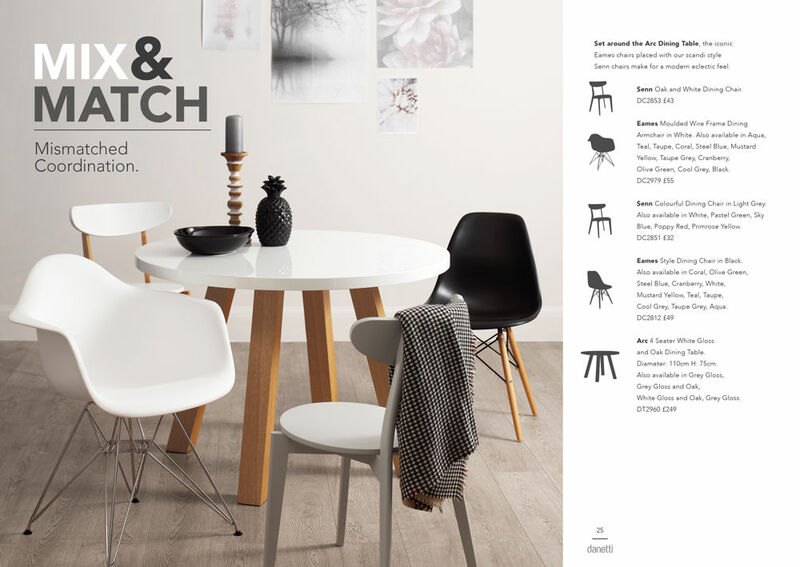 We’ve created our very first look book to illustrate just how dynamic looks and modern style really can be accessible to all. Creating a home isn’t just about the furniture, but we truly believe it’s a great place to start. The possibilities are endless when it comes to colours that the Reflect Grey Gloss and Chrome Sideboard can sit alongside. Spoilt for choice we decided to show off just one colour. A grey on grey look shows just how impactful this beautiful shade can be. Modern Neutrality is about blending celebrating a single shade; matt walls with gleaming high gloss and mirror metallic styling accents. On trend blush isn’t all about sugary shades. We took inspiration from the rich textures of the Tivani Leather Occasional Armchair, with sumptuous leather and the luxe surfaces of the Assi White Gloss And Walnut Sideboard. 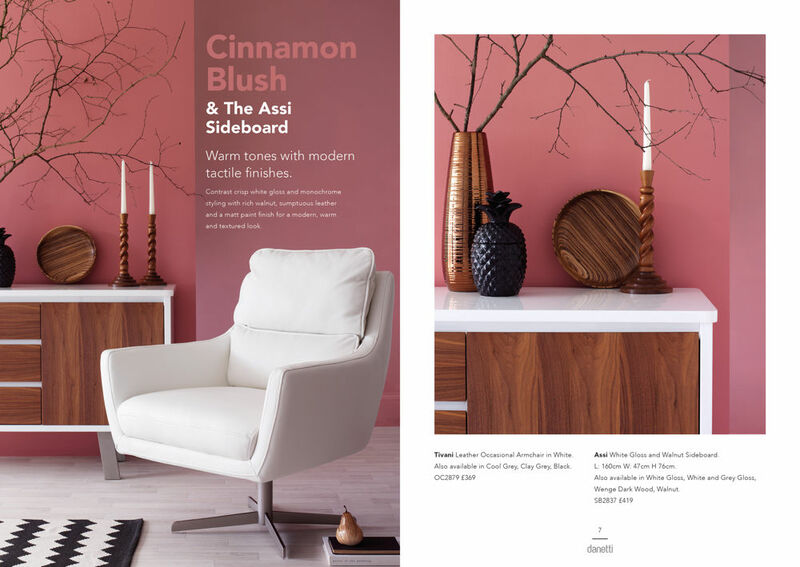 Our take on blush combines rich walnut, adding depth, with crisp gloss which brings the light. It’s a cosy corner with a modern flair. The Wing Leather Occasional Armchair is such an impactful piece. 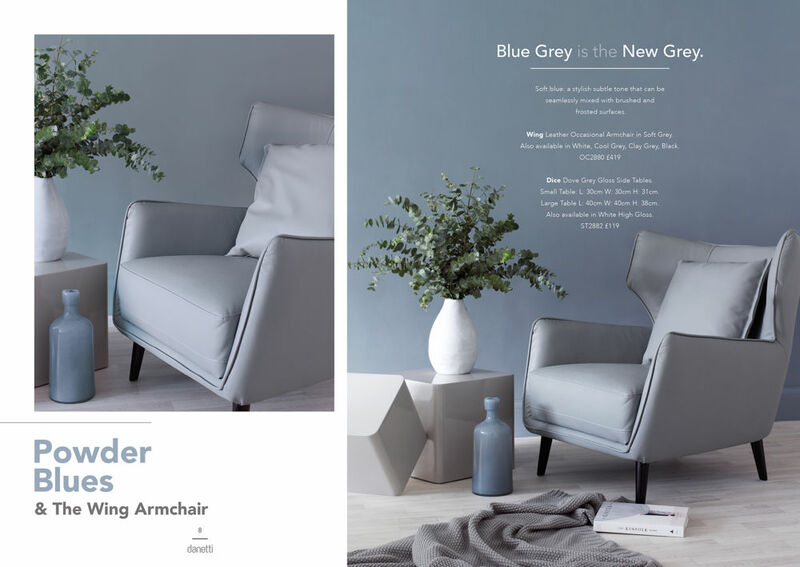 It looks effortlessly good in a powder blue and soft grey palette as its striking form gives this chair its statement stance. We’ve kept this look coordinated but simple, placing the Wing alongside the handy Dice High Gloss Side Tables in dove grey so drinks and books can always remain at arm’s reach. This look is all about the super matte textures and layering them up in chalky powder hues. 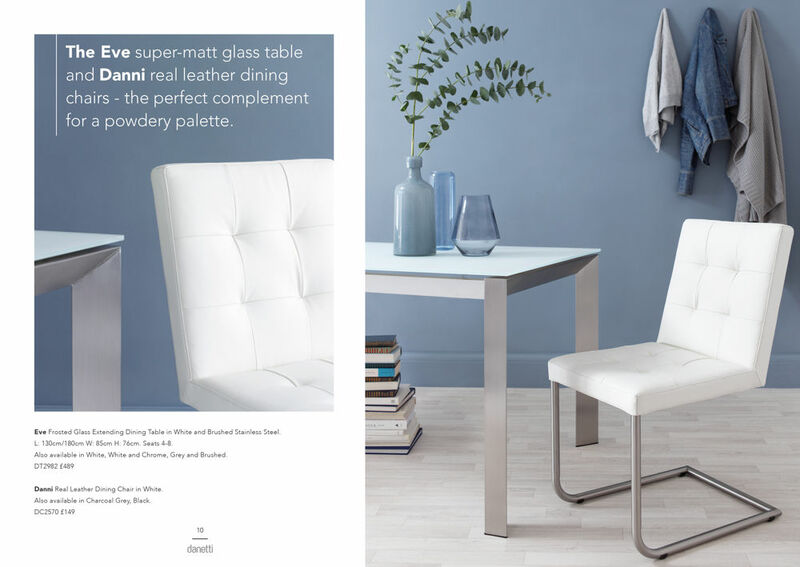 The Danni Real Leather Dining Chair in white and the Eve Frosted Glass Extending Dining Table in White and Brushed truly is a match made in heaven! The hazy surface of the frosted glass gives this setting such a calm and peaceful look while the padded real leather Danni dining chairs provide plenty of comfort. The white leather of the chairs and brushed metal metal legs of both the table and cantilever seat keep this setting looking sleek, seamless and coordinated. The great thing about this look is that it’s so fresh. 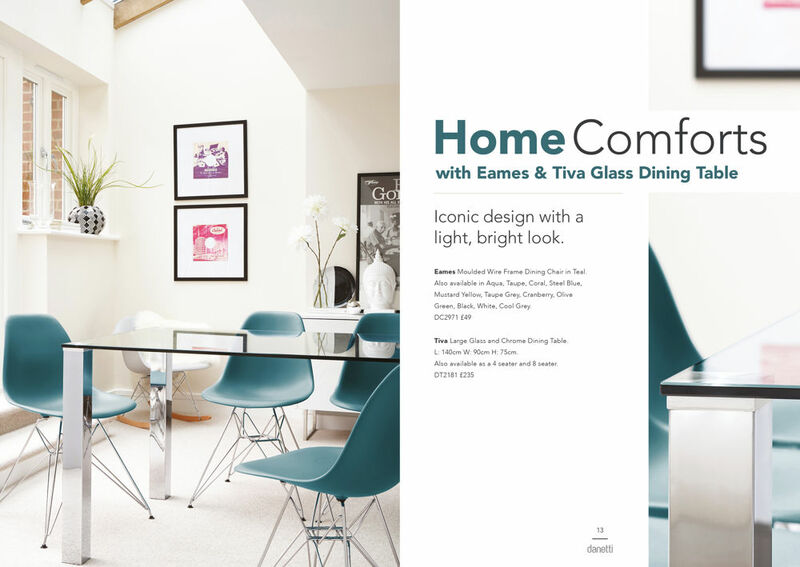 The modern finishes of the Tiva Large Glass and Chrome Dining Table beautifully reflect the light around the space while allowing the iconic shape of the Eames Moulded Wire Frame Dining Chairs to be seen from all angles. We’ve put this set together as we saw it as great opportunity to add a splash of colour to a space, alongside a wonderfully fresh and transparent glass finish. What makes this look so seamless is how it remains uninterrupted by metal elements. The gentle curves and smooth, soft faux leather of the Santo Stackable Faux Leather Dining Chair alongside the tactile oak and matt grey textures of the Zen 6 Seater Oak Dining Table adds such a homely feel to this contemporary dining setting. 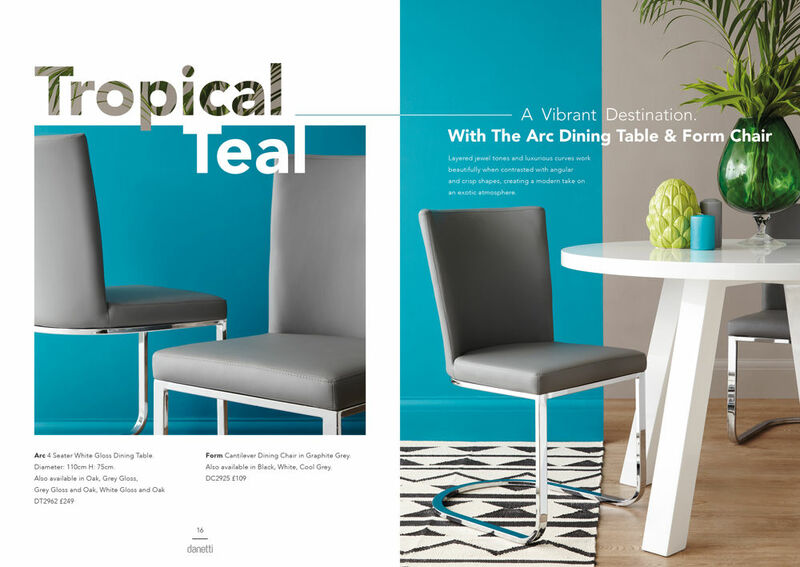 We’ve created a hint of the exotic, layering crisp jewel toned teal with strong and striking forms. Arc 4 Seater White Gloss Dining Table and Form Cantilever Dining Chair both celebrate simple design but with a striking play on linear strength and perfect curves. When the furniture is this strong you can get away with a real flourish when it comes to colour. The cohesive yet blended appearance of the Cross 4 Seater Oak Dining Table and Eames Moulded Wire Frame Dining Chairs is a perfect dining setting for modern homes. It incorporates the traditional with the contemporary, creating a wonderfully combined setting that will have family and friends gathered around the dinner table long after the dinner plates have been tidied away! 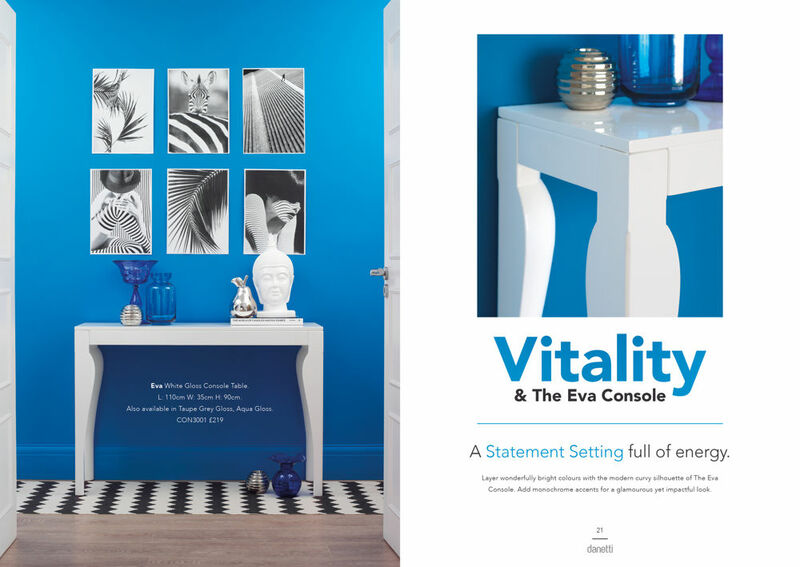 The Eva White Gloss Console Table, in neutral white gloss, just cries out for a splash of bold colour. This look uses positive joyous colour alongside textures of white and dynamic monochrome styling. Practically sized and beautifully designed, the Eva console is perfect for spaces where you need to add a statement or accent. Keeping things sleek yet simple, the Santo Stackable Faux Leather Dining Chair and Eva 4 Seater White Gloss Dining Table are a truly stunning combination. The subtle curves in the Eva’s table legs mirror that of the curved back of the Santo for a understated but wonderfully coordinated look. Even though the look is bold, this look strips it right back and allows the furniture of shine. The ombre wall in spring fresh aqua focusses all the attention on the legs of the table and the form of the chair, making them appear almost in silhouette and highlighting their shape. A great feature of the Glide Sideboard in White Gloss is that it will instantly help to create a brighter, more spacious look in any setting. It’s got bags of understated style credentials. 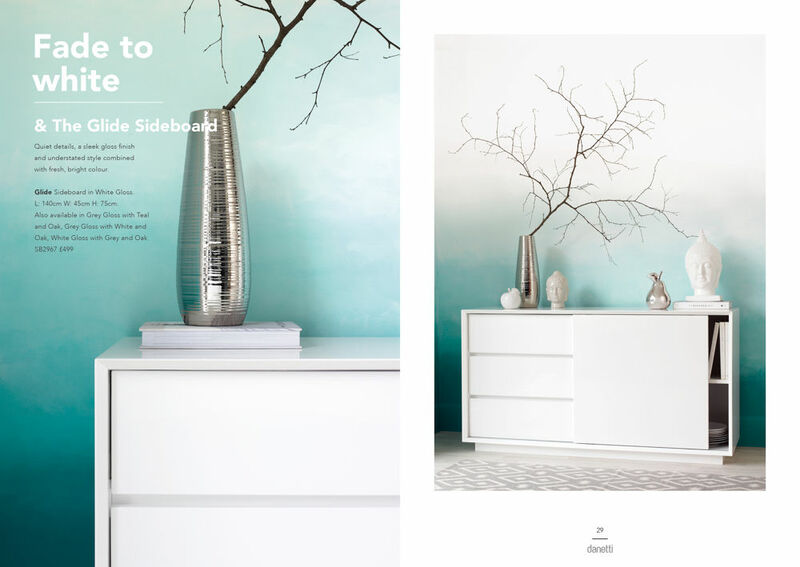 We’ve styled the Glide sideboard, which is part of our ‘Exclusively Danetti with Julia Kendell’ range, in front of an ombre inspired backdrop to create a calming and peaceful look. Just this one item is all this look needs to create a statement space. 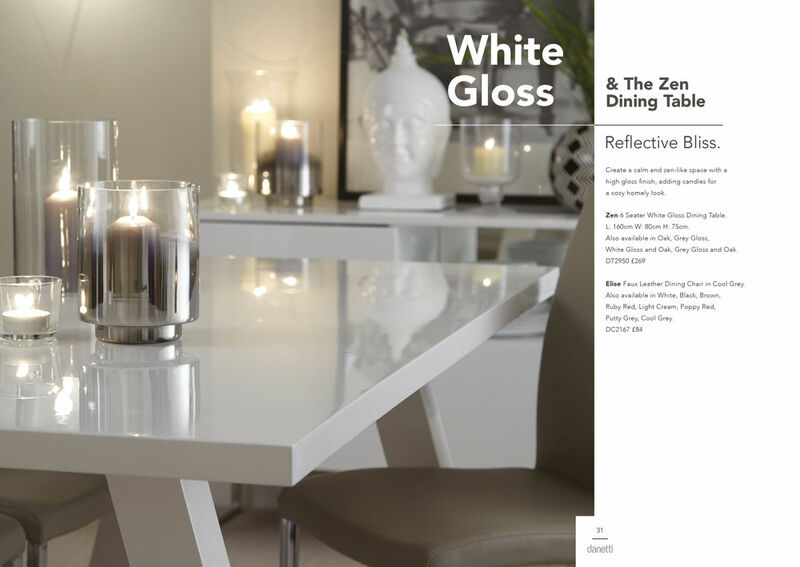 The white gloss top of the Zen 6 Seater White Gloss Dining Table creates this stunning soft mood when you add glimmering candlelight. 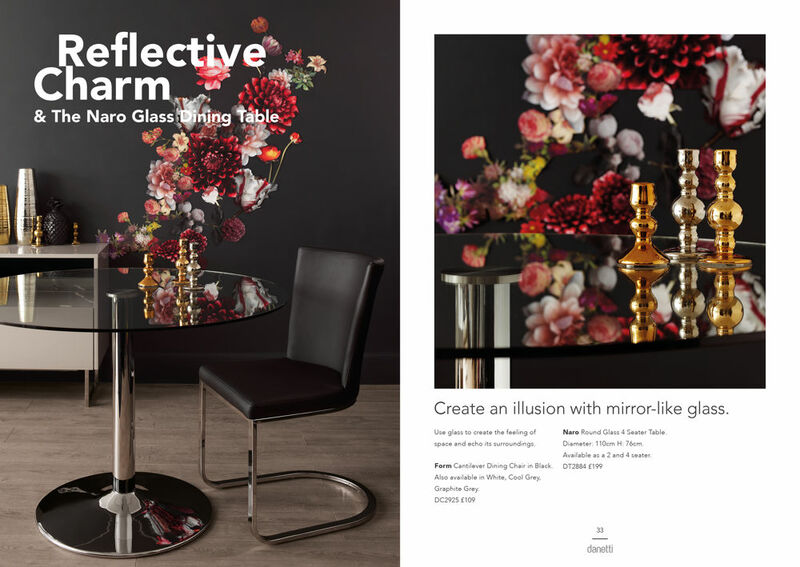 One of the great qualities of a glass table is how beautifully it reflects colours and patterns, appearing mirror like on it’s transparent smooth surface. A bold statement pattern is maximised when reflected in the top of the Naro Round Glass 4 Seater Table. A blown floral decoupage and deep moody walls are brought to life by the furniture, create something opulent and dramatic as a result. 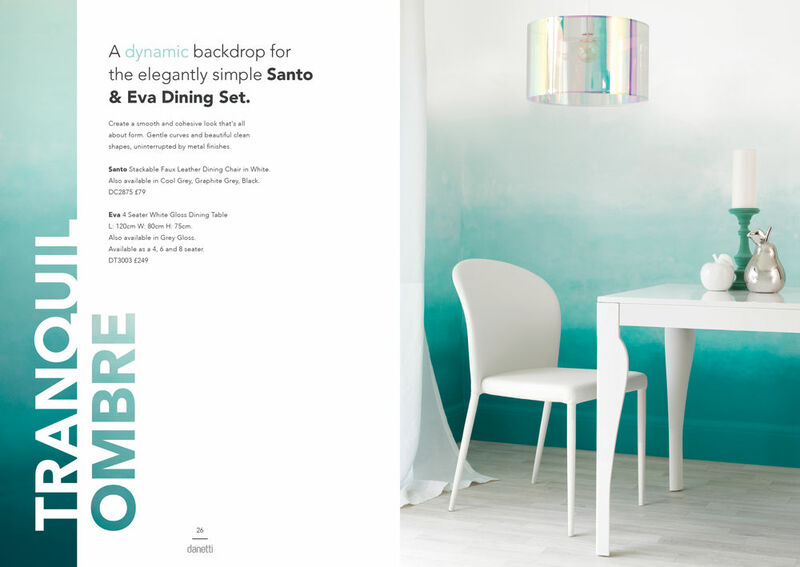 Form Cantilever Dining Chair with its coordinating chrome base and the gentle curve in the seat back mirrors the round table top and blends perfectly with the wall colour. 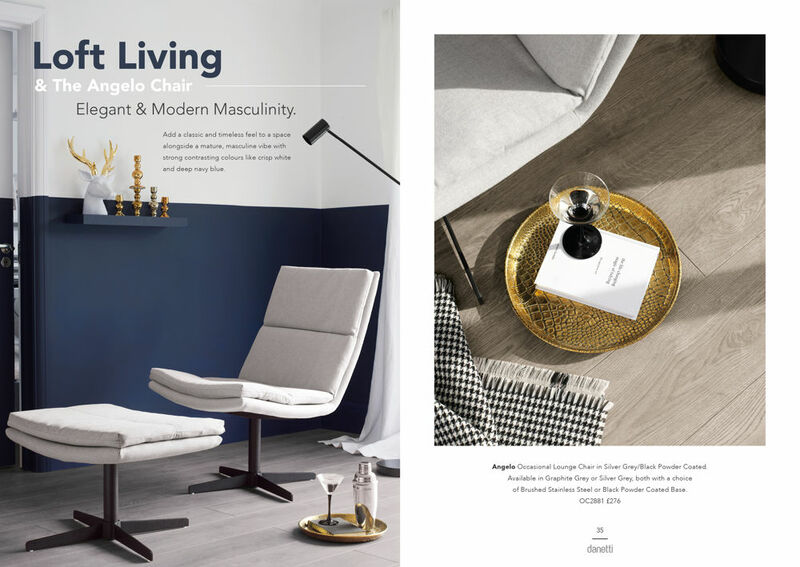 Cool, clean and sophisticated, we’ve created this loft living look by styling the Angelo Occasional Lounge Chair in silver grey in front of a navy blue background. Colour blocking the wall creates the illusion of architectural interest within the room. The dark colour on the bottom envelopes the room in colour but the light top keeps it airy. It’s a combination of the masculine and the elegant for comfy contemporary setting. Mixed materials with a bold accent is a great way to add a flash of colour but stick to a signature style. If you’re a fan of wooden and natural textures but want to incorporate a hint of the contemporary, the Glide Sideboard in Grey Gloss with White and Oak was made for you! 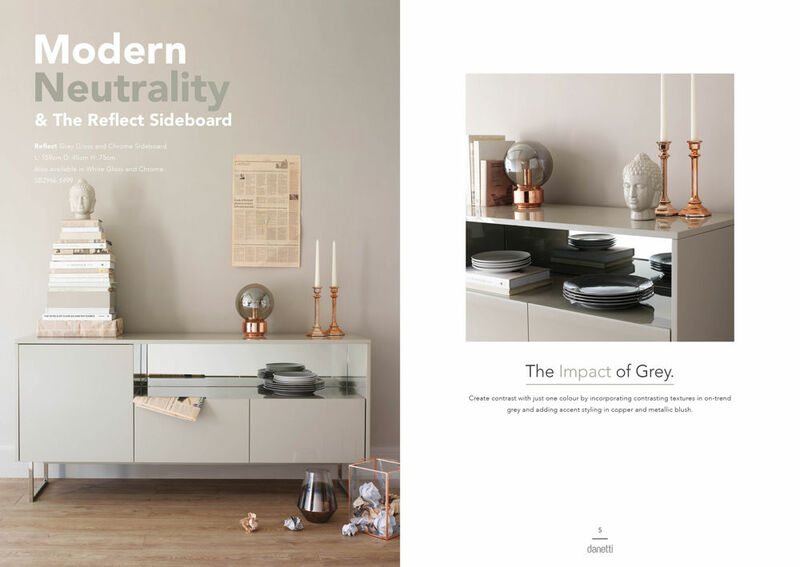 The tactile oak veneer front and taupe grey gloss finish is a great mix with the white gloss sliding panel front as it is a seamless blend of traditional and modern finishes. 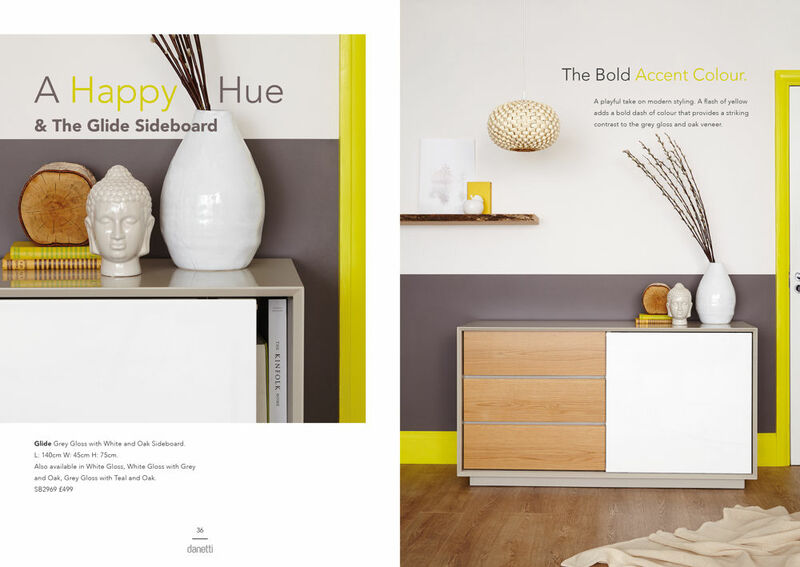 A happy stripe of bold yellow punctuates the look, styled with ceramic pieces and earthy tones for a tactile contrast. 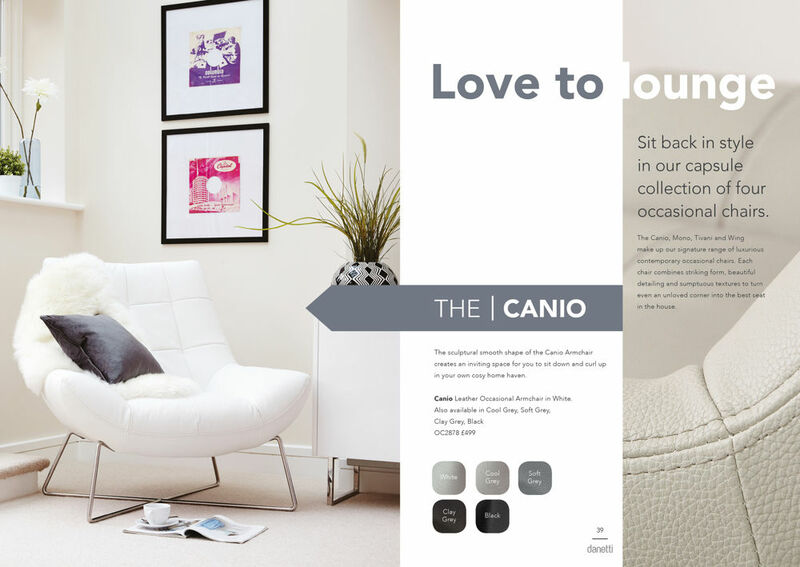 Our range of occasional chairs have been curated with shape, style and comfort in mind. Perfect for sitting down, snuggling up and relaxing after a long day, the Canio Leather Occasional Armchair will give an unloved corner some much needed TLC. The chrome base of chairs like the Canio is great for coordinating with other pieces in your setting, like we have styled here with the Reflect Sideboard in White Gloss. Smart, practical and compact, the Mono Leather Occasional Armchair and Tivani Leather Occasional Armchair are perfect for bedroom corners or hallway spaces where you could do with a small but snug seat. An accent chair in a luxurious fabric creates the perfect perch, changing an unloved corner to a place of sanctuary. We’ve styled this cosy corner with the Wing chair in white, the Assi Walnut Coffee Table and the Tropical Palm Velvet Cushion for a really homely and inviting look. The cushion adds even more comfort alongside a bold pop of tropical colour while the tactile wooden finish of the Assi brings a lovely hint of warmth. 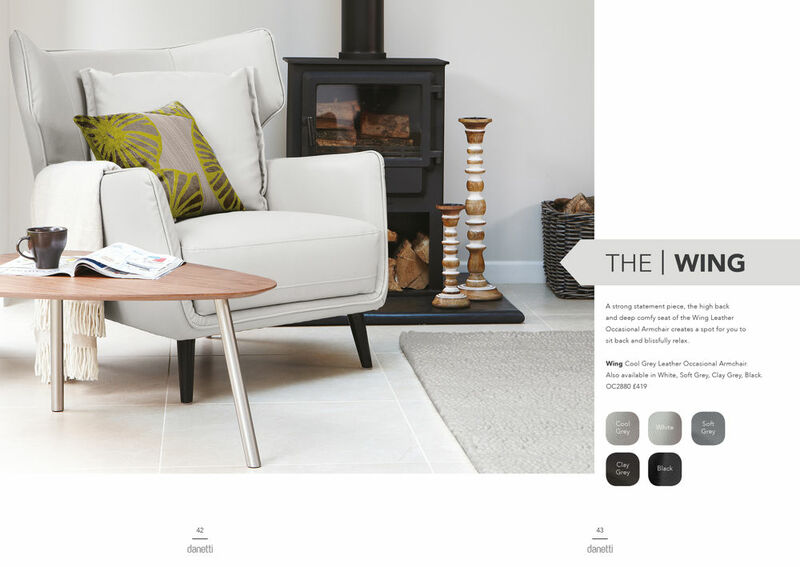 The Wing chair remains the staple feature of this look, creating a cosy yet impactful setting. Iconic, effortless and truly timeless. 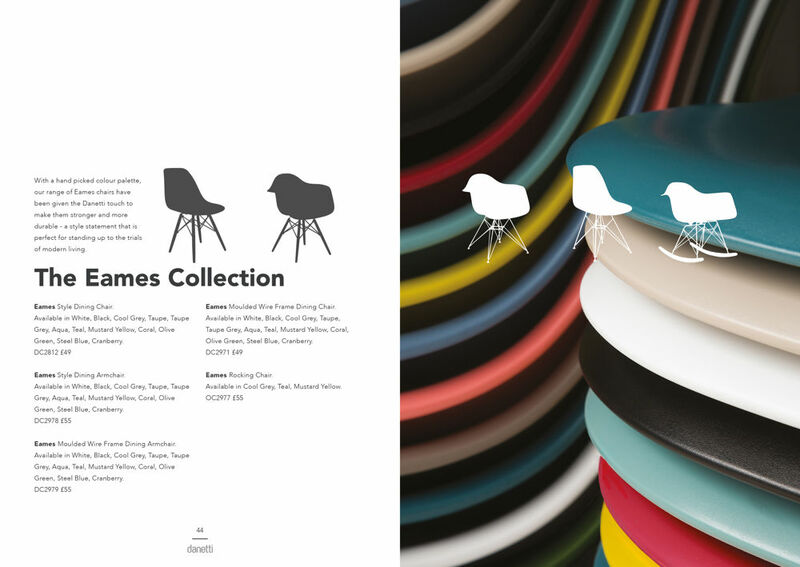 Our collection of Eames dining chairs offer you style, form and function at an amazingly affordable price. 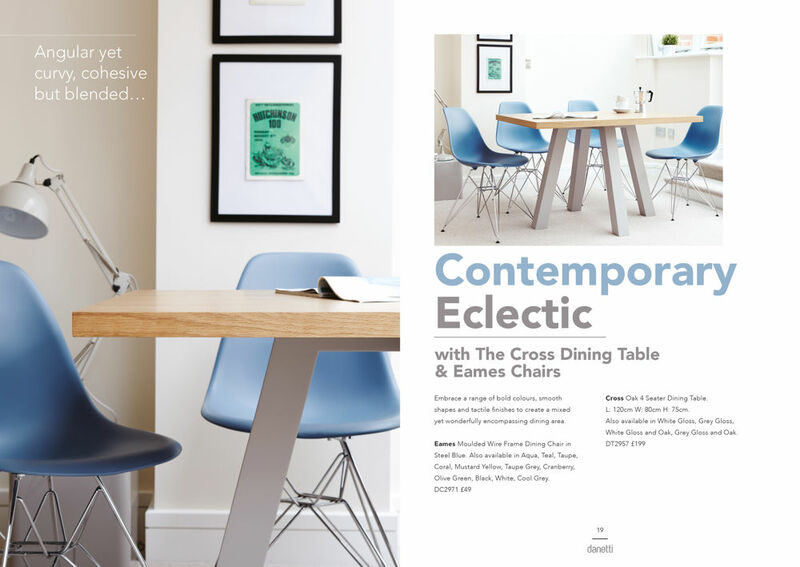 Our Eames collection includes Eames Style Dining Chairs, Eames Moulded Wire Frame Dining Chairs, Eames Style Dining Armchairs, Eames Moulded Wire Frame Dining Armchairs and Eames Rocking Chairs all our signature colour palette. 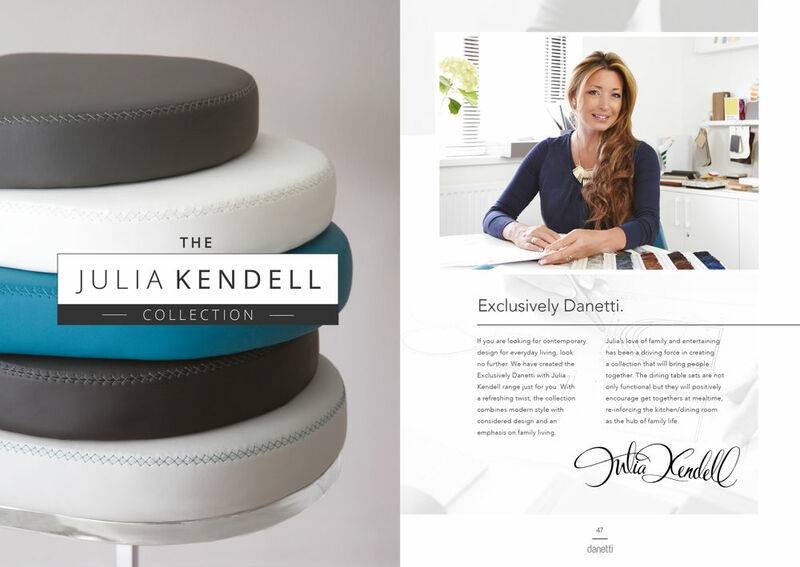 The ‘Exclusively Danetti with Julia Kendell’ range is the result of our in house design team collaborating with interior designer and TV presenter Julia Kendell. 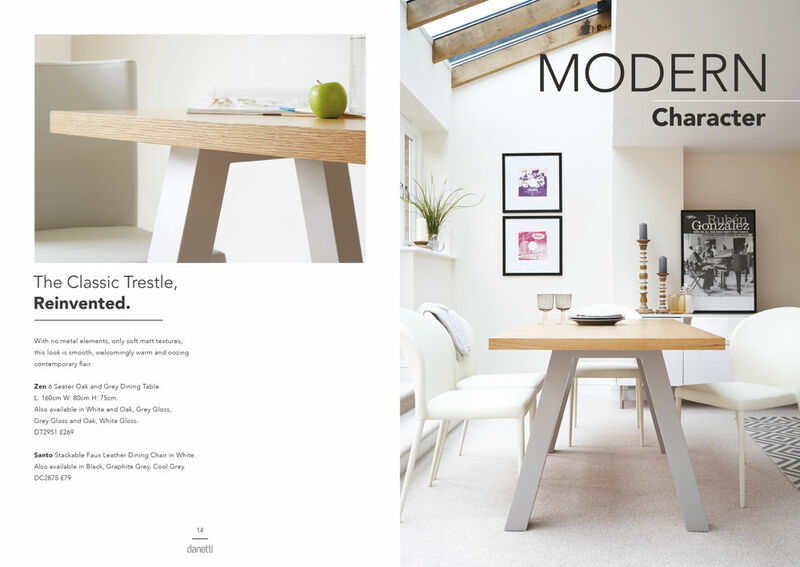 The collection is a modern range with a refreshing twist and strong emphasis on bringing families together. 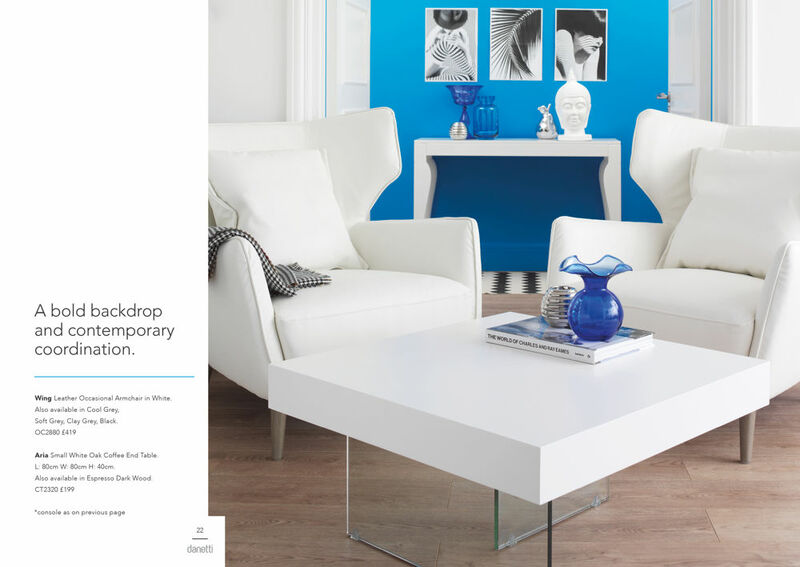 If you would like to discover more about this stunning range, visit our ‘Exclusively Danetti with Julia Kendell Collection' page. 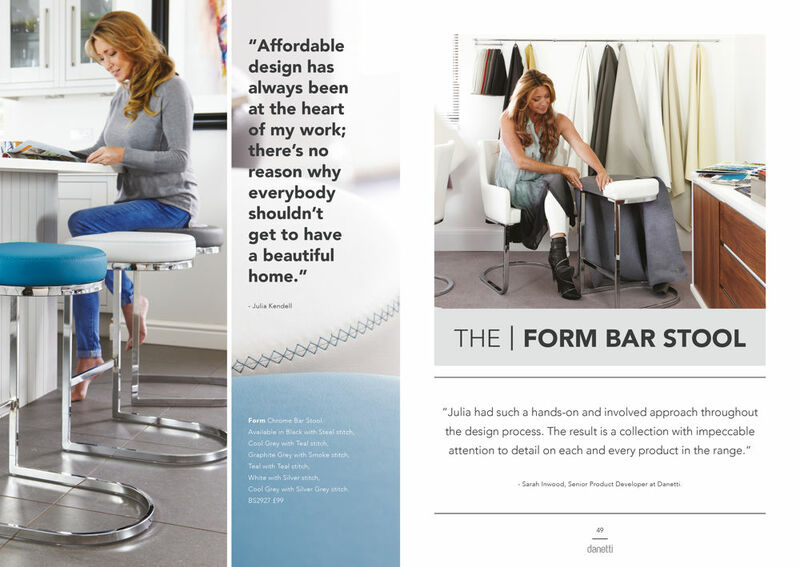 The Form Chrome Bar Stool is a staple piece of the ‘Exclusively Danetti with Julia Kendell’ collection. This ergonomically designed bar stool is a perfect accompaniment alongside the Form Cantilever Dining Chair or Form Cantilever Dining Armchair, either around a stylish breakfast bar or in a modern kitchen setting area. 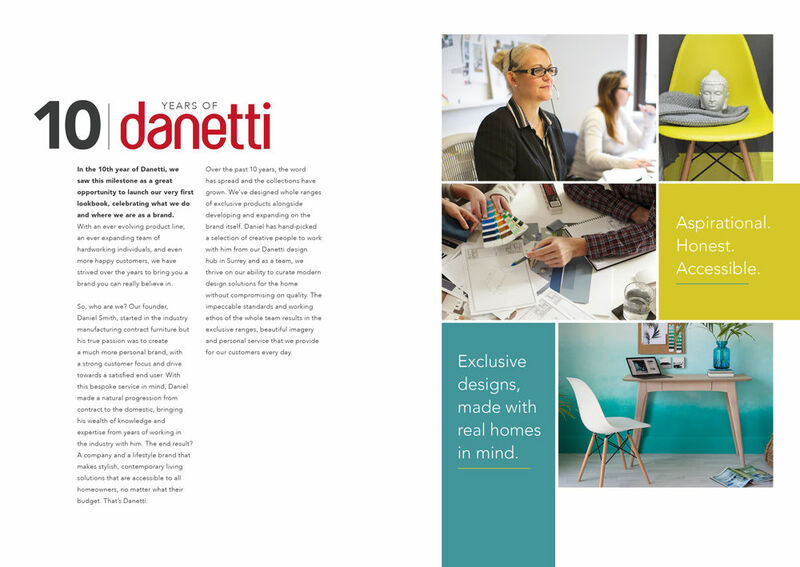 Bringing the family back together in the home was a true driving force in the creation of the ‘Exclusively Danetti with Julia Kendell’ range. 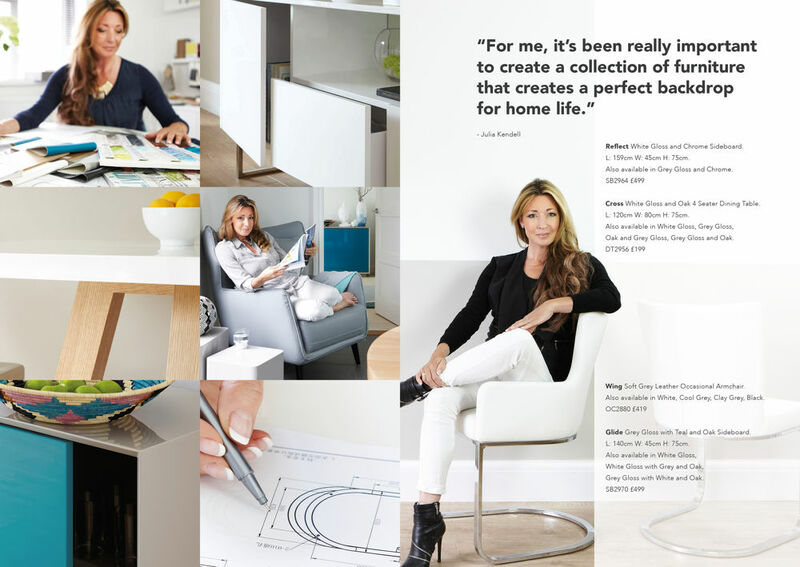 Julia’s design ethos is much like ours in wanting to create stylish yet affordable furniture that is available to everybody. 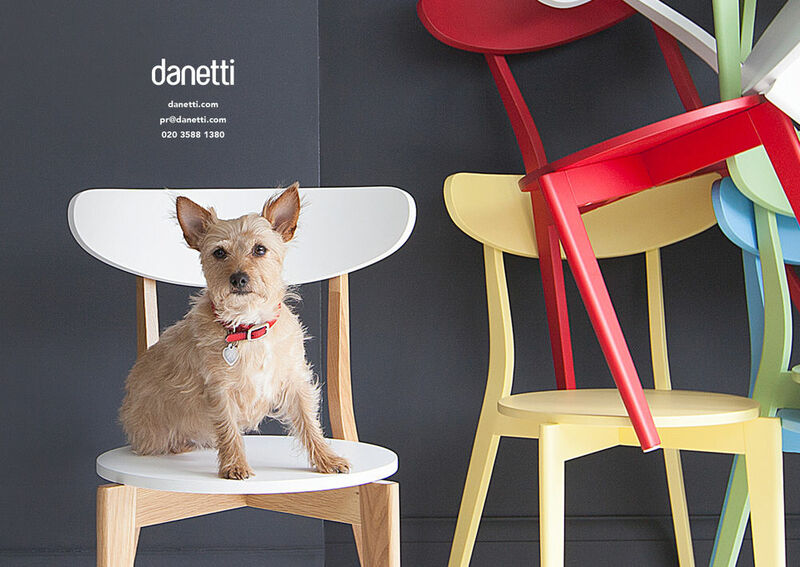 You can view the whole collection here: ‘Exclusively Danetti with Julia Kendell Collection'. This year Danetti had its 10th birthday. To celebrate this milestone we wanted to do something that little bit more special. This lookbook is a celebration of what we do, designed to inspire and show you how to create the looks we love. 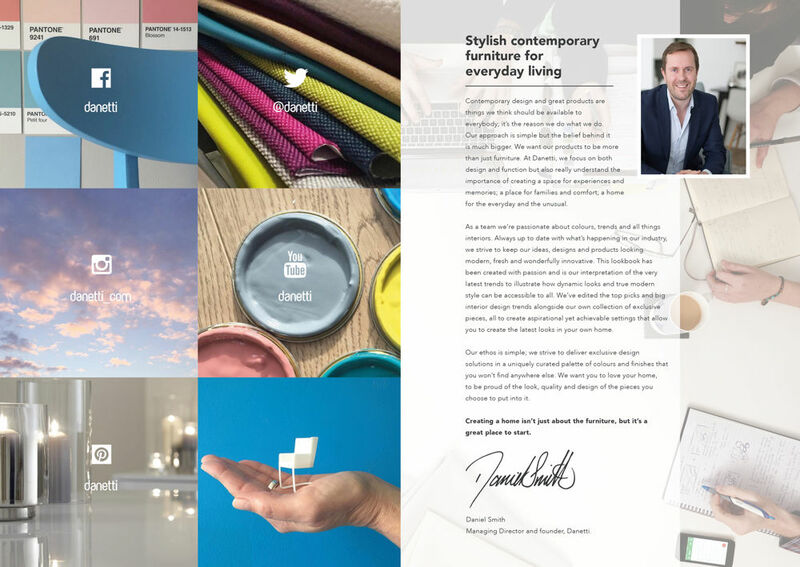 We’ve come a long way in 10 years and are so excited to keep bringing you innovative design and modern furniture solutions for many years to come! Like what you’ve seen? Whether it’s your favourite look, piece or styled shot, we’d love to hear what you think. 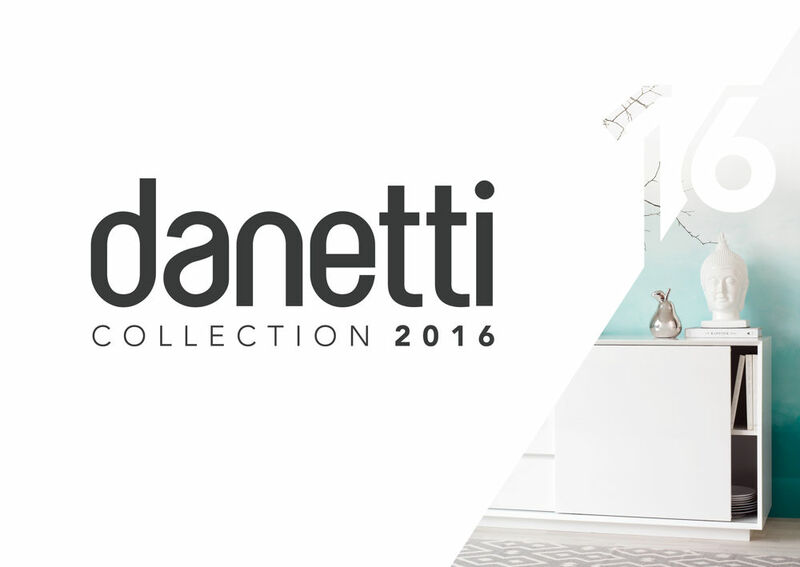 If you’d like to have your own copy of our Danetti 2016 lookbook, please do contact us. You can also check out our Facebook and Instagram to get your daily style fix. We post loads of design inspiration, behind the scenes action and styling tips to keep you up to date with everything interiors!